Passion Fruit Truffles have an exotic white chocolate-passion fruit filling surrounded by rich semi-sweet chocolate. This truffle recipe is elegant, unusual, and really delicious. To make these truffles, I use Goya brand passion fruit puree, found in the freezer section of my local supermarket. For optimal taste and texture, use the best white chocolate you can afford (this means no white chocolate chips!) and take the time to temper the semi-sweet chocolate. If you've never worked with candy molds before, be sure to check out the photo tutorial showing how to make molded chocolates! 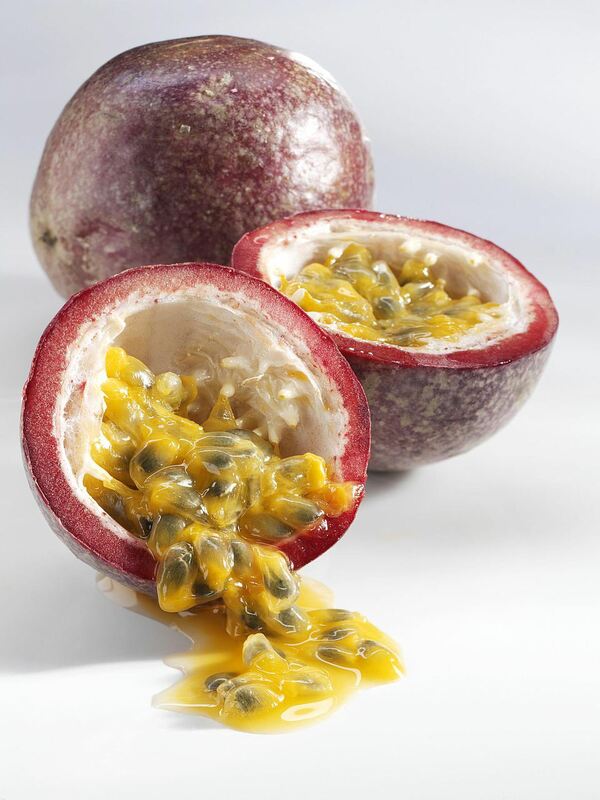 If you are using passion fruit puree, pass it through a mesh strainer to remove the solids from the juice, and discard the solids. Place the 2/3 cup of juice in a small saucepan with the light corn syrup and the heavy cream over medium-high heat. While waiting for the passion fruit mixture to boil, finely chop the white chocolate and put it in a heat-safe bowl. Once at a boil, pour the hot liquid over the white chocolate and immediately begin gently whisking to melt the white chocolate and emulsify the mixture. If you have a handheld immersion blender, use it to blend the passion fruit ganache together. Otherwise, just continue whisking until you have a silky smooth mixture with no bits of white chocolate remaining. Press some cling wrap over the top of the ganache and refrigerate the bowl until the ganache has cooled and can be spooned, about 2 hours. Alternately, you can refrigerate it overnight, and then take the bowl out of the refrigerator the following day and let it sit at room temperature until it loosens up. When the ganache is almost ready, start preparing the molds by tempering the semi-sweet chocolate, following these instructions. If you don't temper the chocolate, it will become soft at warm room temperature and might turn dull or sticky. Tempered chocolate remains hard and shiny, with a good snap. An alternative to tempering chocolate is to use chocolate-flavored candy coating or to keep the truffles refrigerated until just before serving. Use a spoon to fill the clean, dry candy molds with the tempered chocolate, all the way up to the top. Once full, turn the molds upside down and allow the excess chocolate to drip back into the bowl. Take a bench scraper or metal spatula and scrape it across the top of the molds, removing the excess chocolate. Refrigerate the molds to speed the setting process of the chocolate, for about 10 minutes. Once the chocolate lining the molds is set, spoon the passion fruit ganache into each mold, leaving some space at the top for a layer of chocolate to seal up the truffles. It is better to have a little less ganache and a good chocolate seal, as opposed to more ganache that leaks from a poorly sealed truffle. Spoon some of the semi-sweet chocolate on top of the ganache in each mold, and spread it until it completely covers the ganache and seals in the sides. Again use the bench scraper or metal spatula to scrape across the bottom of the mold, removing any excess chocolate from the edges. Refrigerate the molds to set the bottom layer of chocolate. Once set, gently turn the molds upside down and pop out the truffles. Store Passion Fruit Truffles in an airtight container in the refrigerator for up to a week, and serve at room temperature.